So, who wants to be on the Strawberry Street Team? Anyone can participate by posting the Fall 2017 Festival flyer on your favorite public bulletin board. Send us a picture of yourself, with your posted flyer, and you’ll be entered into a drawing to win one of two pairs of 4-Day Camping tickets to this year’s Fall Festival. 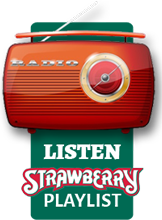 Please send your photo submissions, with your name, phone number and email address, to info@strawberrymusic.com or mail to P.O. Box 664, Jamestown, CA 95327. Submissions must be received by midnight, on Monday, August 14th, in order to qualify for the drawing. On Tuesday, August 15th, two winners will be chosen randomly and will be contacted privately, as well as posted publicly, along with their photo submissions. Unlike most of our contests, every photo submission will be counted as a separate entry, so long you have permission to post the flyer and each photo is taken in a different location. That means the more flyers you post, the better chance you have to win. 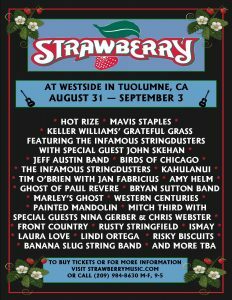 Please call our office M-F, 9-5 at (209) 984-8630, if you have any questions about how enter the Strawberry Street Team ticket contest. Thank you for helping to spread the word about Strawberry and good luck! The dates to the contest were originally listed incorrectly and have been changed to reflect the right information. Contest submissions are due by Monday, August 14th and the drawing is on Tuesday, August 15th. Sorry for the confusion and good luck!